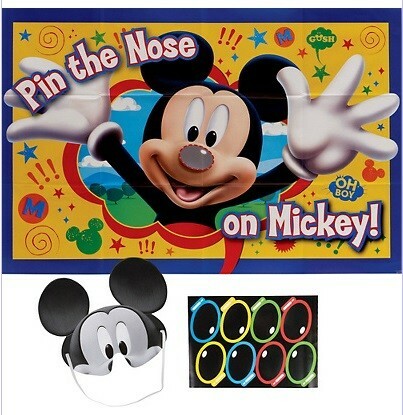 Pin the nose on Mickey! Our Mickey Mouse Party Game features the most beloved Disney character of all, Mickey, busting through the open "window" to Mickey Park. Yellow game board is adorned with an array of colorful symbols and a navy blue trim. The nose stickers have a blank space to personalize each one, while the Mickey Mouse blindfold comes fully equipped with an attached elastic string for easy placement. Blindfold each little Disney dude or darling and have them take turns trying to pin the nose sticker on Mickey's face. Package includes 1 plastic game board measuring 37 1/2in x 24 1/2in, 2 sticker sheets with 8 stickers total and 1 blindfold.